Woo Hoo, what a pretty piece! I notice that you start at the bottom and stitch "up". I do this too! Somthing about starting in the lower left and moving up a piece makes me feel like I'm accomplishing something faster? Anywhoose...lovely. Just lovely. Peppermint Lane is very pretty! I love homemade gifts - they bring back the true meaning of giving - why spend a fortune when a gift made with love is much nicer! Peppermint lane is looking beautiful. How fast you are! Beautiful and preatty work! Peppermint Lane looks very pretty. I love the colors of that project - the pinks and whites and pinky-reds instead of just glaring red and white. nice discloths, too! I've made those before; they work really well - when the people you give them to will actually use them, lol! My giftee thought they were too pretty to use. 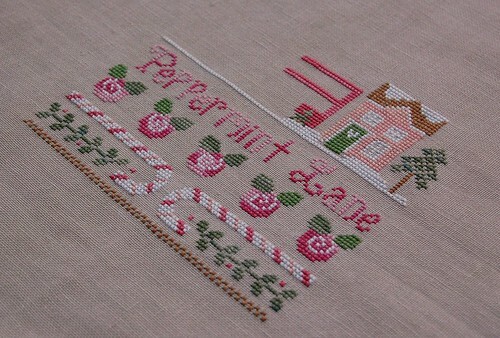 I love that Pattern of Peppermint Lane...that is going to be so pretty. Your Dishcloths are real pretty too.. I too crochet and I would love to have the pattern for the Dishcloths. Peppermint Lane is looking great ! The dishcloths will be a nice surprise and the ribbon looks great. I love this PL piece! You have made beautiful progress too! What a great idea...crocheted dish cloths...and I love the ribbon you used to wrap around them. Homemade gifts are the best! Very nice progress on Peppermint Lane, Nicole. Those dish cloths are lovely – and the ribbon to present them in is cute, too. I would love to receive a gift like that – I really appreciate receiving hand-made gifts at Christmas – it’s much nicer than a gift certificate! 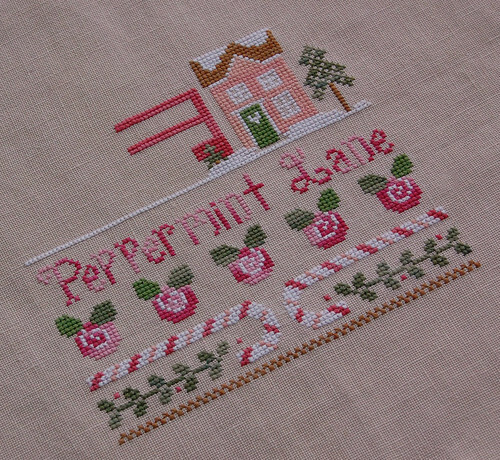 Your Peppermint Lane is looking great! Those are the best kind of dishcloths. I always snap them up when I find them at craft fairs, but would love to be able to make them myself. Do you have a pattern for them? So glad to see handmade gifts. I have decided that is all I'm giving this year. Of course, that doesn't mean they will be large, but they will be handmade. Some are just things that I've had finished, but not yet framed or "finished". Needless to say, my Santa's Workshop is busy! Wonderful work, is beautiful. very very beautiful. With love from COSTA RICA. Great stitching, Nicole. PL is looking so bright and cheery. Handmade gifts are always the best. I'm sure they'll love the dish cloths and the effort you took to make them. Peppermint Lane is coming along great. It doesn't take long and it'll be done. 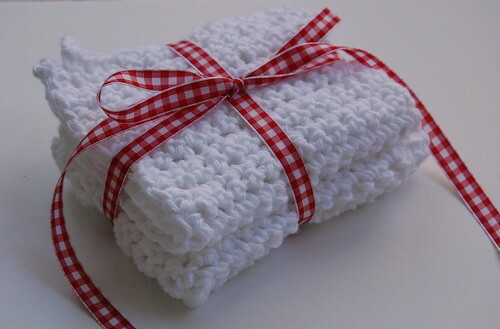 I love your gift idea of the crocheted dish cloths. Those little handmade gifts are so personal and will certainly be appreciated.